Fall is a beautiful season. And so do sensory bins that are full of colors, scents, textures, tastes. They are kids' favorite! Sensory bins are not only fun, but very beneficial for brain development and exploration of the world. The rich media of the bins can be used for learning activities and creativity - the possibilities are endless! (As you can tell by this paragraph, we are in love with sensory bins at this house). We found the most inspiring and spooky ideas for Halloween fun. Rubber Boots and Elf's Shoes put together a beautiful Sunflower sensory bin. Adventure in a Box has the cutest small world bin with the houses for the little critters in the woods. 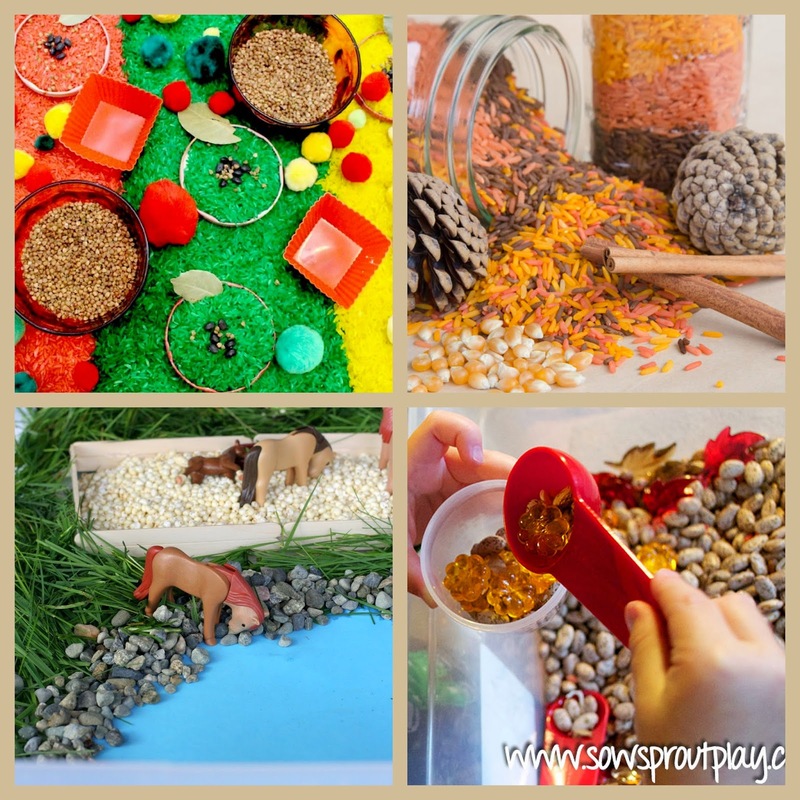 Red Leaf, Yellow Leaf sensory bin with lots of natural materials is shared by a squirrel and birds and can be found at Stir the Wonder. They also set up a fun Apple Pie sensory bin. A huge Working Farm that has all the creative details to make farm animals cozy was found at Teach Me Mommy. Their sensory Fruit and Vegetable Farm activities are very engaging! I Heart Crafty Things put together a beautiful Apple Orchid sensory bin. I love that kids can actually do apple picking in the orchid! Acorns Everywhere! - a fun book and a sensory bin. Very cute leaf people in a birdseed sensory bin can be found at Creekside Learning. Have fun sorting and practicing fine motor skills while learning to CARE. Spring or fall, learning to recycle and preserve the nature is always so important. 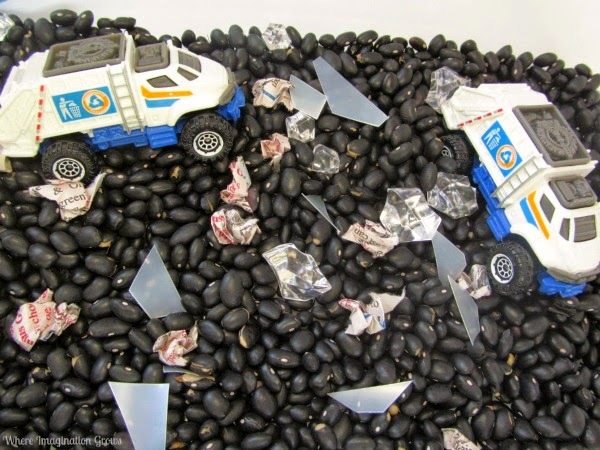 I'd love to feature this Community Helpers Recycling Sensory Bin from Where Imagination Grows! Color mixtures and the textures are at heart of Apple sensory activities set up by Life Over C's. Fun At Home With Kids enjoyed playing with their Farm World sensory bin. You can find cinnamon sticks and pine cones in the Fall sensory bin put together by Mom vs The Boys. 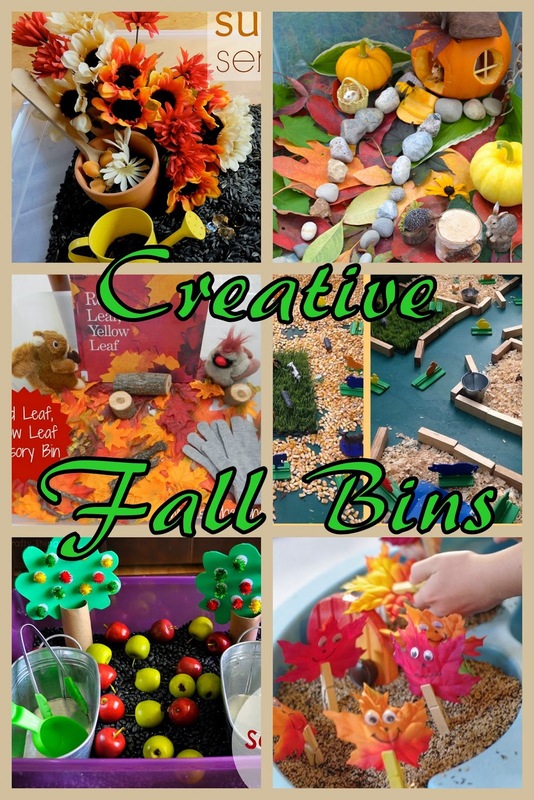 Sow Sprout Play set up a Fall bin with lots of creative play possibilities. 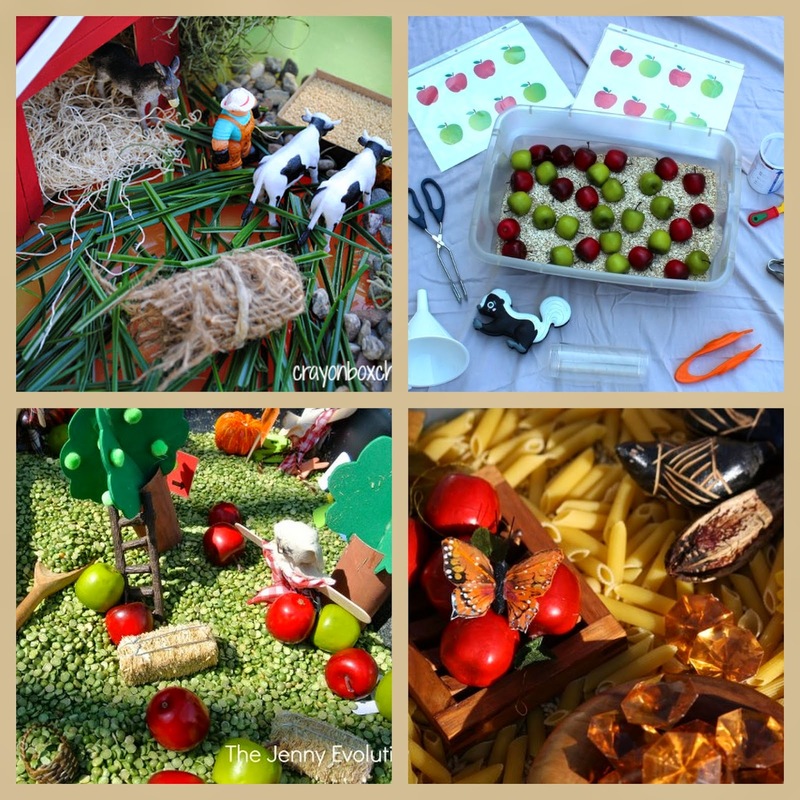 Crayon Box Chronicles made a fun Farm Small World sensory bin. The barn and the fence are made with popsicle sticks! Teaching Mama featured a nice Apple Sensory Bin. Her invitation to play with the free printables are very engaging! The Jenny Evolution created a farm play land using various materials and dried peas as a base. Happy Hooligans enjoyed all the beautiful fall colors: apples, pumpkins, nuts, pinecones, guards, sunflowers, and even amber gems! 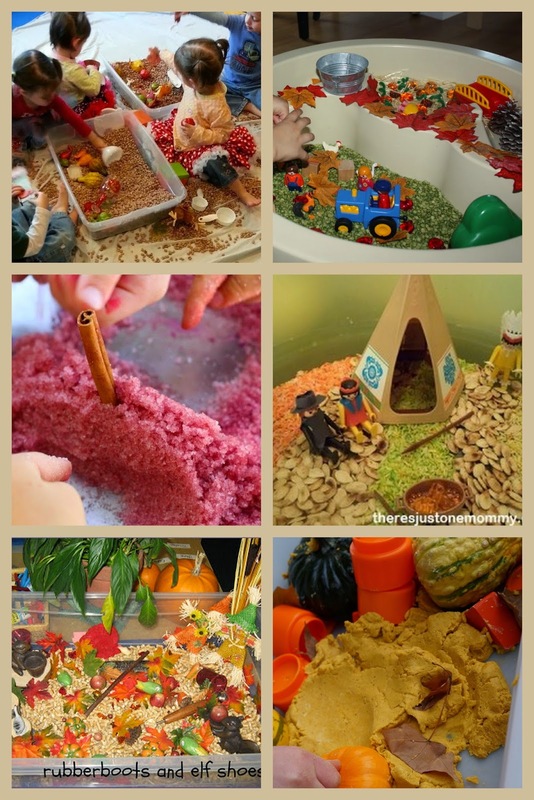 Check out their Fall Sensory Bin. Quadruplets and their friends can be caught in action playing with their Fall Sensory Bins here: A Beautiful Ruckus. Apples and Pumpkins Small World Play is featured over here: Little Bins for Little Hands. Their small world consists two sensory bins in a water table and includes a fun book and math activities. Pinecones, oats, and cinnamon sticks were used for the wonderful Scented Sensory Bin. You can feel the smell just by looking at the pictures at My Nearest and Dearest. You can scoop some apples, beans, and acorns, as well as read a fun fall book with No Time for Flashcards. And finally, a beautiful, engaging, and Aw, smelling so good! Apple Cinnamon Sensory Tray from Learn. Play. Imagine. The kids used it for letter practice, counting, and imaginative play. There's Just One Mommy roasted pumpkin seeds saved from the Jack-O-Lanterns to make a miracle Thanksgiving little world with colored rice, teepee, people and animals. Life with Moore Babies were on a hands-on adventure to discover what farm animals eat for their Community Helpers: Farmer theme bins. In The Playroom set up their Big Machines on the Farm small world sensory play. You can see wood and nature in action over at Rubber Boots and Elf Shoes. Their Fall Sensory Bin is very engaging. Wildflower Ramblings created a fun Pumpkin Play Dough bin with gourds and orange toys. Their Corn Meal sensory bin features The Little Lamb book. The Chaos And The Clutter built their farm on popcorn seeds and dry noodles - very realistic and fun looking small world! They also enjoyed playing with their fun Fall sensory bin. Fun with corn can be found over at Makeovers Motherhood. I thoroughly enjoyed reading all these posts and looking through the pictures. This is truly a treasure and joy of fall. I hope, you will find this collection entertaining and inspiring. Happy Fall Fun with your kids!